The Navodaya 2019 Online Application submission date has been extended till December 15. Students who are studying in the 5th Class (currently) are eligible for Navodaya Entrance Exam. Help the child to send this matter to their parents, or around them, and apply them to the Navodaya. 3. Student father or mother or guardian Signature. Jawahar Navodaya Vidyalaya Admission Last date to apply is December 15: Jawahar Navodaya Vidyalaya Admission Last date to apply is December 15 for 6th class admissions The registration process for class 6th admission is going on through the official website. The registration process has started from November 1 and to continue till December 15, 2018. The interested and eligible candidates can apply online through the official website of JNV - navodaya.gov.in. The entrance exam for class sixth admission would take place at 11:15 am on April 6, 2019 at various Jawahar Navodaya Vidyalayas across India. The Admit Card for the class sixth entrance test can be downloaded from the official website form March 1, 2019 onward, till the exam date. The result for the same will be declared on the last week on May 2019. A candidate who has not been promoted and admitted to Class-V before 30th September, is not eligible to apply. Admission in Jawahar Navodaya Vidyalaya is made on the basis of a Selection Test, designed and conducted by the CBSE. The test is called the Jawahar Navodaya Vidyalaya Selection Test (JNVST). It is of non-verbal nature, class-neutral and designed so as to ensure that talented children from rural areas are able to compete without facing any disadvantage. Special care is taken to ensure that children from far flung areas get admission forms free of cost, without any difficulty. 1 NVS Exam Notification NVS Notification Released on 21-10-2018. Navodaya Vidyalaya Samiti, An Autonomous Organisation under Ministry of Human Resource Development, Department of School Education & Literacy, Government of India. Admission Notification - Last date of Application through Online. Navodaya Vidayalaya Samiti notified for admission process for admission to class VI in Jawahar Navodaya Vidyalayas through JNVST-2019 for the session 2019-20. Registration of students is in progress through online & offline mode. Last date to apply for JNVST 2019 up to 15 December. Last date for submission of JNVST-2019 Class VI admission applications through online mode only. Step II: Submission of Personal Details (including uploading of Images). Kindly keep the scanned copy of candidate's signature, parent's signature, candidate's photograph and class V certificate (Size:10-100 KB in .JPG/.jpg format) ready before filling up personal details. Note:If all the are not completed,then your candidature will not be considered. 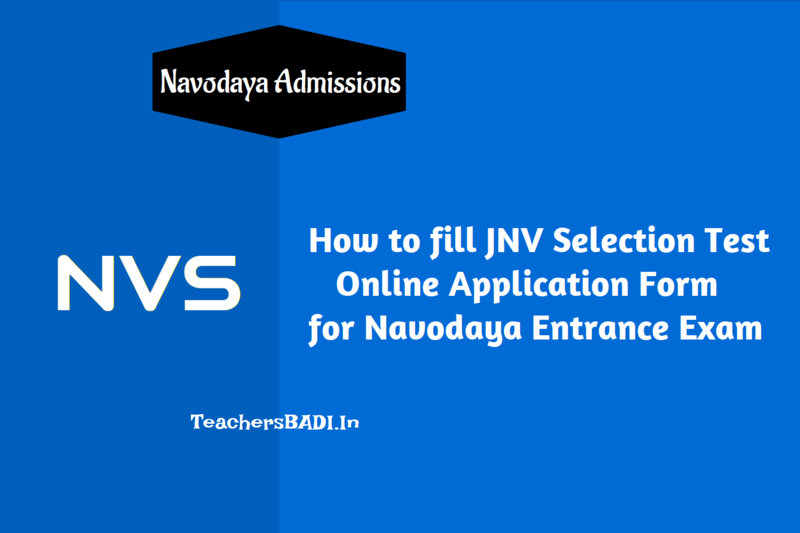 How to register Online for J NV Selection Test 2019? i. The process for submission of application for JNV Selection Test has been simplified through online process. Registration can be done free of cost through the admission portal of NVS linked through www.navodaya.gov.in Verification of proofs for residence, age, eligibility etc will be done for selected candidates through the laid down procedure after the declaration of results. ii. The eligible candidates have to fill up the online form and upload the certificate issued by the Head Master/Principal where the candidate is studying in class V with the photograph along with signatures of both candidate and his /her parent/guardian. The attachments should be uploaded in jpg format of the size between 10-100 kb only. iii. In case of candidates from NIOS, candidates should obtain `B‟ certificate and residence should be in the same district where he / she is seeking admission. iv. Online platform is in open source and free of cost. Application may be submitted from any source like desktop, laptop, mobile, tablet etc. Admissions in JNVs are made through the JAWAHAR NAVODAYA VIDYALAYA SELECTION TEST (JNVST) to Class VI. The medium of instruction in JNVs is the mother tongue or regional language up to Class VIII and English thereafter for Maths and Science and Hindi for Social Science. Students of the JNVs appear for X and XII class examinations of the Central Board of Secondary Education. While education in the schools is free including board & lodging, uniform and textbooks, a sum of Rs. 600/- per month is collected from the students of Classes IX to XII only towards Vidyalaya Vikas Nidhi. Students belonging to SC/ST categories, Girl students and the students whose family income is below poverty line (BPL) are exempted. Rs.1500/- per student per month is collected from all students whose parents are Govt. Employees. The online application form for admission to Class VI in Jawahar Navodaya Vidyalaya is self-explanatory. However, following guidelines may be specifically kept in view by the students and their parents/guardians. 1. Please read the Prospectus carefully. Fill in complete information after ensuring that the candidate fulfills all the prescribed requirements such as date of birth within specified range (01.05.2006 to 30.04.2010 - both days are inclusive), schooling in classes III, IV & V in recognized institution(s). (Govt. / Govt. Aided / Recognized / NIOS). 2. Carefully fill the certificate to be uploaded along with the application form with regard to category i.e. General, SC, ST, OBC & Divyang. In case at the time of admission, it is found that a candidate has opted SC/ST though he/she does not actually belong to SC/ST community, his/her selection is liable to be cancelled. 3. (a) Mention the date of birth in figures as well as in words. Write correct date of birth as per school records. In case, if it is observed at a later stage that the date of birth of the candidate does not match with the school records his/her candidature is liable to be rejected. (b) Permanent identification marks which can be identified clearly shall be mentioned in the application form by the candidate. 4. Signature of both, the candidate and the father / guardian should be uploaded while applying for the Jawahar Navodaya Vidyalaya Selection Test. CAUTION : Application Form is liable to rejection if columns are left blank or the entries are incomplete. Applicants should ensure that they fulfill all the prescribed requirements of education, age and of special categories (like SC/ST/Divyang) area (Urban/Rural) wherever applicable. If any information given in the original application form is found to be false / incorrect on subsequent verification, even after the selection of the candidate, the admission is liable to be cancelled and the decision of Navodaya Vidyalaya Samiti will be final and binding. No correspondence shall be entertained in this regard. Such admissions, if any obtained by any candidate on the basis of false certificate / declaration / information shall not only be cancelled but Samiti also reserves the right to recover the expenditure incurred on a student during his/her entire stay in a Vidyalaya. What is this common service centre? Does it mean any computer with internet connection? Can you provide me any link for online submission of forms for entrance test for class 6 and class 7. I have gone through the website so many times but couldn't fine the option for filling up forms. I also have visited many Common Service Centers but they don't have any idea where to start filling up forms. The information you provided above has already been provided by many other people but none of them have any idea how to fill the forms. All have just copied brief details from prospectus but no one has replied when people asked about link to fill up forms. Kindly help me by providing link for online submission. you should apply directly throuh online mode website at https://www.nvsadmissionclasssix.in/nvs6reg/homepage and no need to pay any fee. Candidates first got Registration in Phase I and Appl with your login credentials..